The first bus was pretty straightforward with the owners goal to get her to the Wolfsburg museum for display. 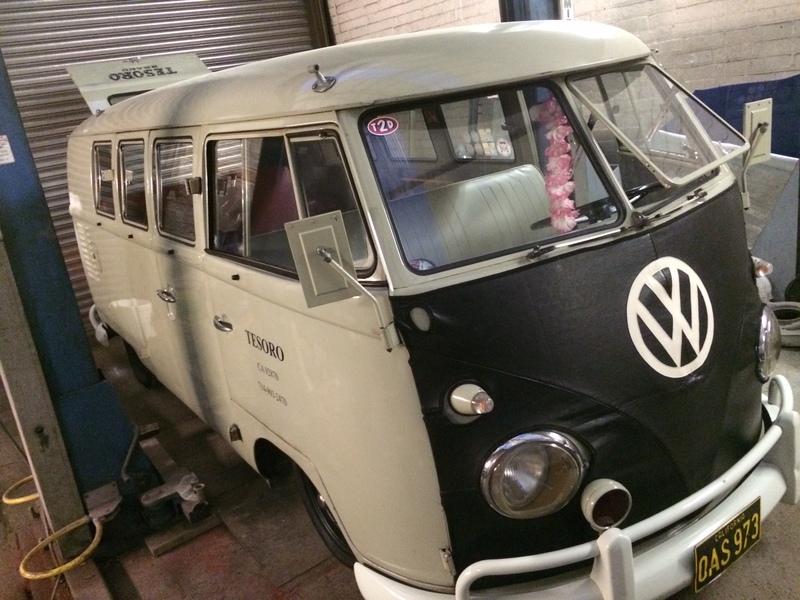 Although we where initially informed that the bus had new sides and was which where welded in by a very well regarded welder in the VW scene there where still many problems to correct. The newly installed long side panel bowed out by 30mm away from the body between the fuel filler and the arch top. The replacement front panel had been seam welded 30mm in from the ‘A’ posts causing lots of panel distortion rather then being unpeeled and folded back on. The ‘B’ posts where unfinished with the floating cargo door tapping plates not held in. 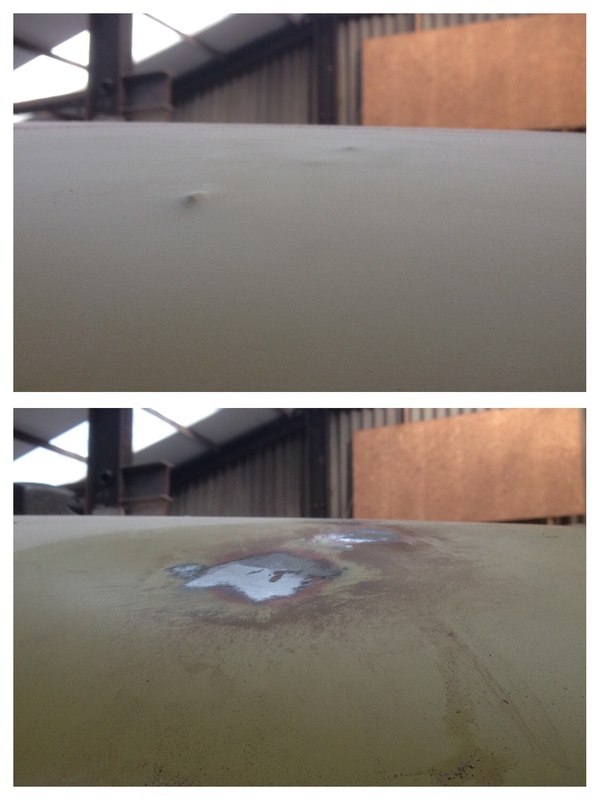 A replacement used roof had also been fitted (correctly) but the metal condition was very dubious along with some rather server lumps where something had been wedge in to the cargo area and produced horns on the roof. Along with many other little bits and pieces. Anyway you get the picture. Punch marks on the roof removed using a blow torch and hammers to shrink the excess metal flat again. Dent in the rear corner. Also heat shrunk and hammered back in to shape reducing the need for heavy fillers. Luckily unlike Bay window campers the rear high quarters can be accessed and hammered from inside. You can see the bow in the new long side panel. We had to unstitch, re-position and weld the rear third and hope that this relieve the tension causing the bow. As you can see it did the job. Final prep and paint on the roof. 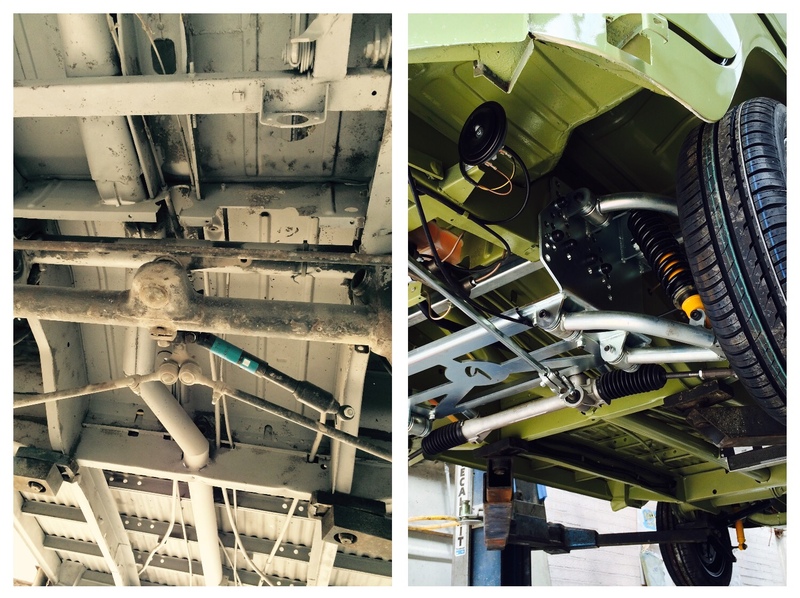 much easier to paint the roof before the VW splitty was removed from the rotisserie. As you can see the paint is taken over the gutters, that way when the mid section is done the masking for that can go over the gutters giving a double coating of paint and not leaving a potentially exposed gutter edge. Which can occur if masking is only done from either side of the gutters. 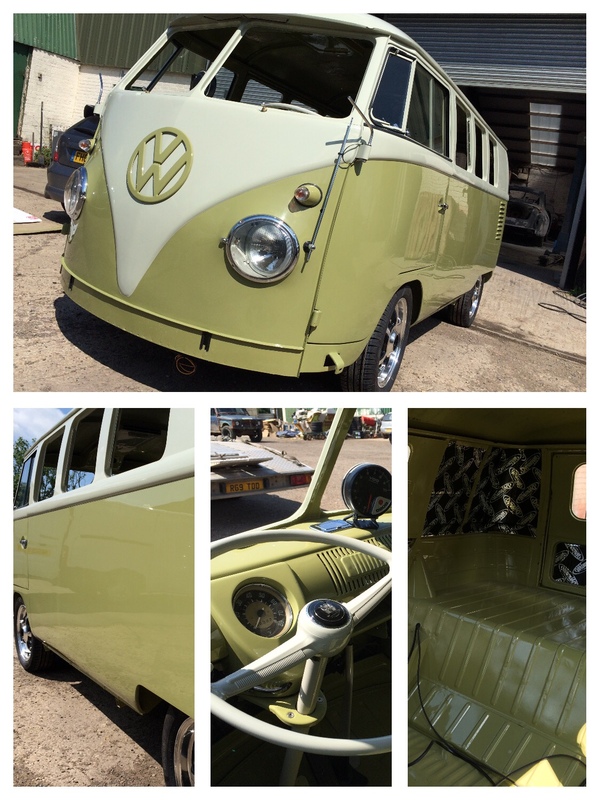 VW L346 Mango was applied first in 2K Direct Gloss. We let the paint drift into the top section as this reduces the sharpe paint edge that can appear next to masking lines between the two colours. This also has an additional benefit of making sure there is no exposed primer layer which might otherwise occur when reverse masking against previous mask lines. After the first coat a slight wave was visible in the misshapen panel so some remedial work was required. 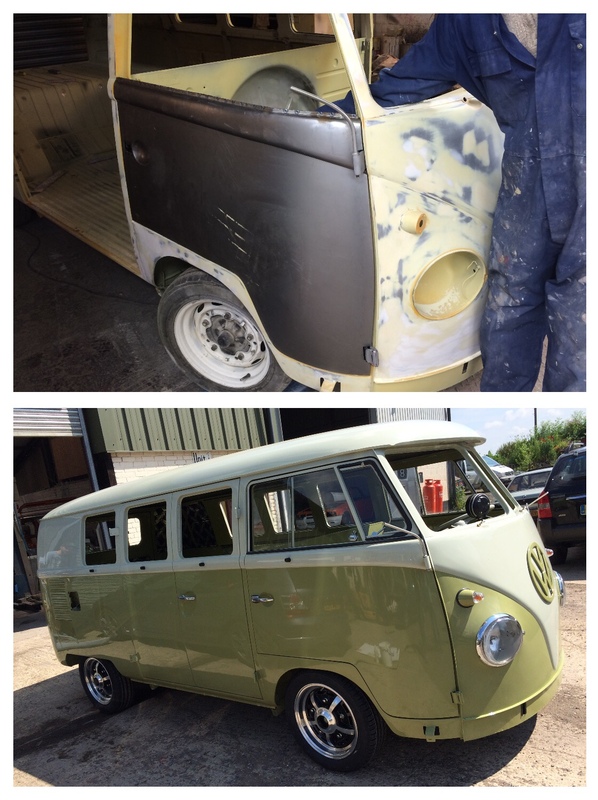 Obviously and as allways with VW splitscreens many spraybooth sessions are required to paint all the two tone Off panels (Doors, cargo, engine lid) and the single colour parts like the Engine tine ware, pop out frames, handbrake, gearstick, parcel shelf to name but a few. Before I go on to the second L346 Mango and L347 Sea gull grey Early Split i am going to show you this rather cool Rat bus owned by local club member Cluade. This VW splitscreen van is just cool with it’s California orange farm sign writing and paint patina. 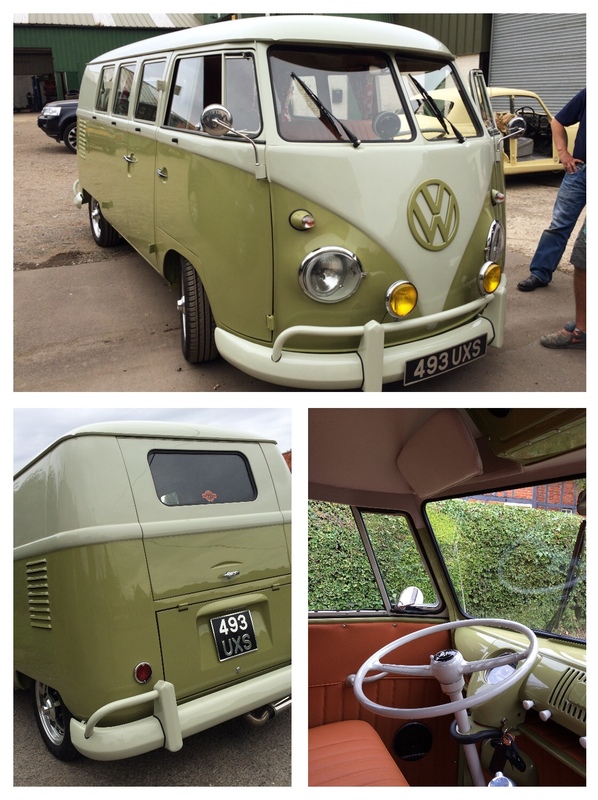 Although Claude loves the patina in the VW L345 Light Grey paintwork there where a few defects that he did not want. Like the Scratches where it dragged along his garage door frame and the dents on the rear corner as a result of shipping. He always wanted to get these sorted but was very worried about maintaining the patina on the bus. 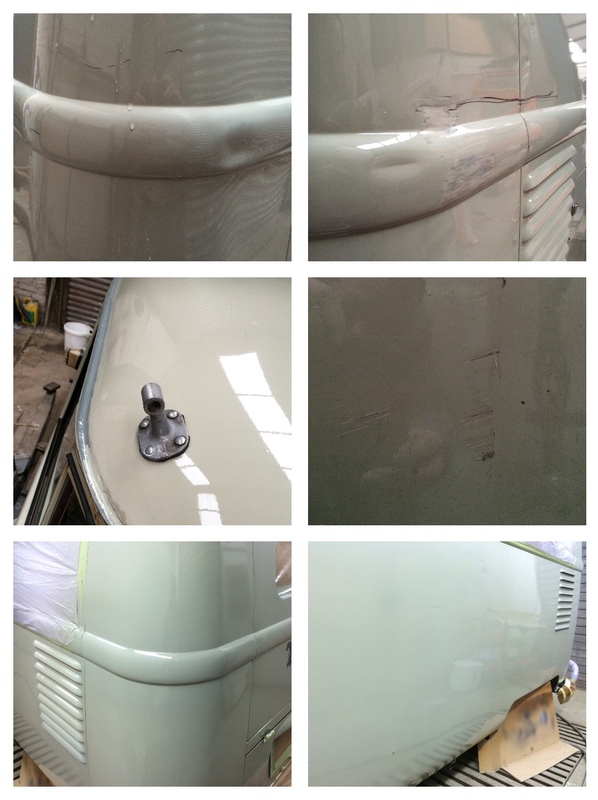 So after we repaired the dents we painted the repairs and then duplicated the patina paintwork. How did we replicate the patina? read the image caption below for details. The problems with Cluades bus where only superficial; Dark grey sealer in the gutters and around some of the pop out windows, dents in the side panels, scrape down the side, and some rust in the front and rear popout window apertures. Although it is not visible in the photos the patina on this bus had small drak grey patches, clearcoated over exposed metal and rusted high spots, and grey speckles all with over the body. The high spots where easy to keep we just danded the new paint off these areas and used a rust solution to quickly part age them. The grey patches where from low areas so we dusted a dark grey paint over the new paint panel then rubbed it off so it only remained in the low panel areas. The dark grey speckles where replicated by using old airbrush speckling techniques, including bouncing the paint off a deflector (piece of cardboard) and extremely low gun pressure. 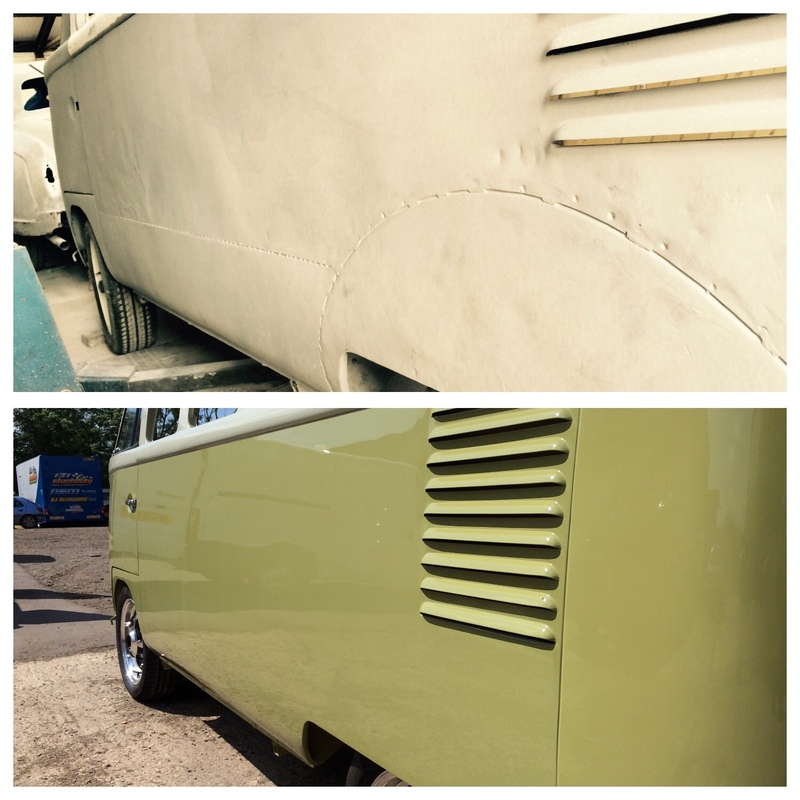 The next Mango splitty that we had lined up came to us with a blue and white hand painted matt finish body. The van was bought as a restored bus from a restoration company that used this classic VW van as a workshop van. They obviously ran out of enthusiasm when it came to the paint work. 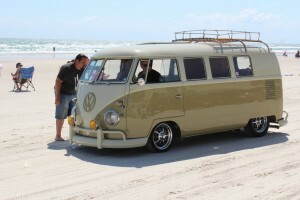 The client also arrived with a printout of this picture saying ‘this is how i want my bus to look’. Can’t blame him this is a cool bus. Unfortunately this bus had been through a recent restoration and it was covered in a thick layer of filler. 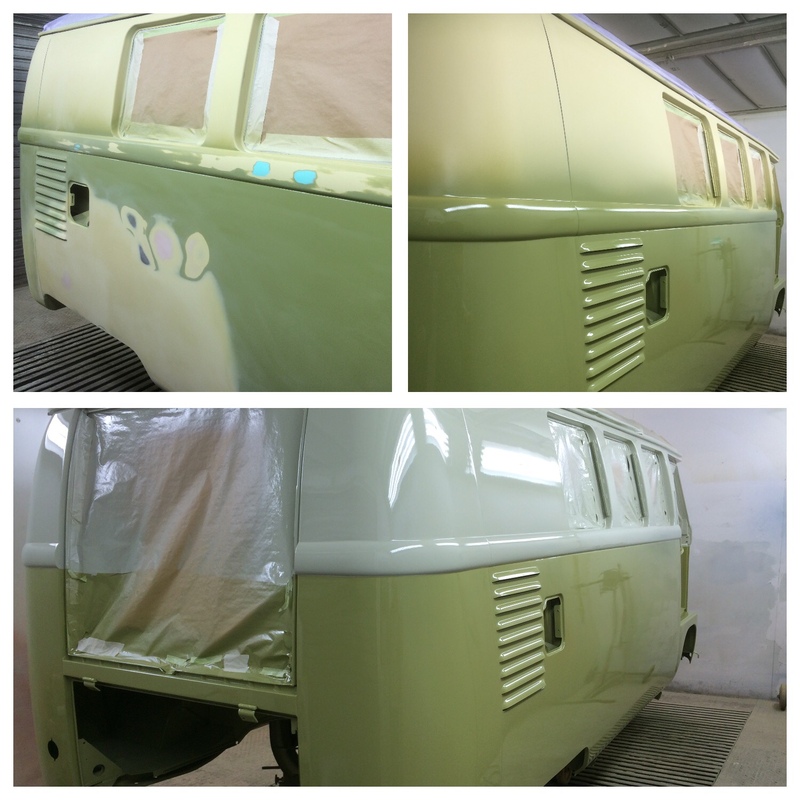 As the bus was really only supposed to be in for a colour change the discussion soon evolved in to having the van soda blasted to check the metal underneath and to find out why so much filler was applied. Obviously this level of filler always raises alarm bells. Would the filler be stable and stay on with the thickness of application? is it hiding some nasty panel problems or even rust? And even if the filler was removed how much of the panel could we straighten with the panels attached to the frame work inside? Needless to say the client decided that in for a penny in for a pound was the best attitude and who can blame him, why spend out on a shiny paint job when it may have problems in a year or two due to the filler below. 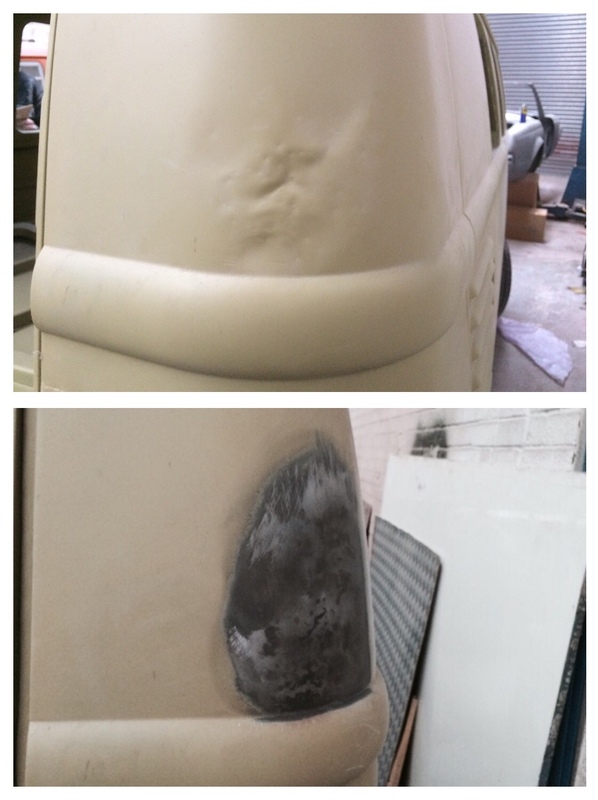 The panel condition after blasting (not our welding) and the final repaired and painted result. There was a lot of work to get the panel to the condition you see here. we did manage to get the panel fairly level using just the hammers and a long straight edge to check progress. In places we broke the welds to the frame to allow the panel to move forward and in other places we pushed and pulled the frame work to move the panel. It still required some filling but no where near the amount that was previously on there. The van also had new panels in the engine bay and a new door skin due to old accident damage and a new rear lower quarter and window apertures repairs due to rust/perforations in the metal. The top picture shows the trial fit of the door with new skin (checking the door framework had not moved). You can also see the body is in first primer stages. This is our standard process on all full paintjobs. Once the main welding and dent removal is complete the vehicle is primed, guide coated and sanded The exposed metal areas show where the metal is high and the orange spec (usually black) show low areas. 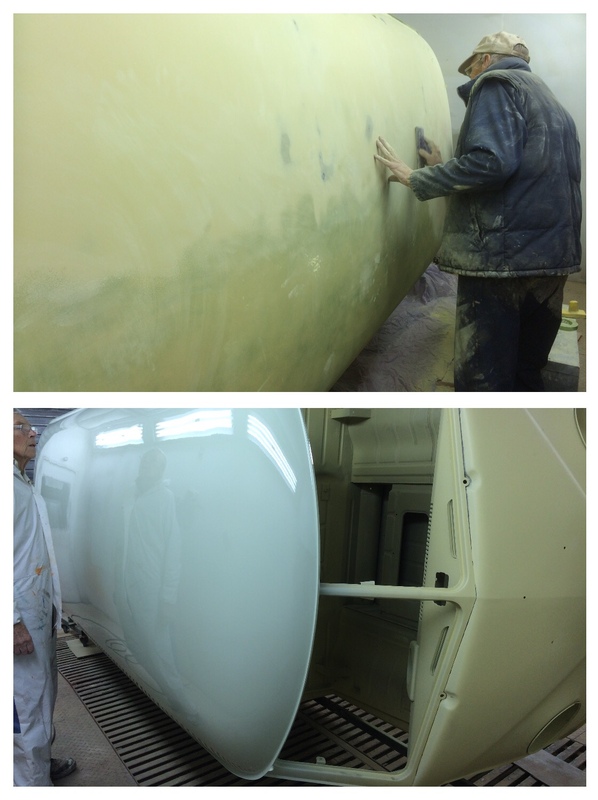 This process is carried out twice on all visual areas of the car. The first time highlights and allows us to rectify and the second time allows us to check our work and any missed areas. Although we can never totally sure until the car is in paint just how level everything is. A couple of images of how the bus left us on the way to trimmers. Bumpers will be mounted at a later date and have been modified to discretely mount and hide the wires for the yellow original Hella spot lamps. 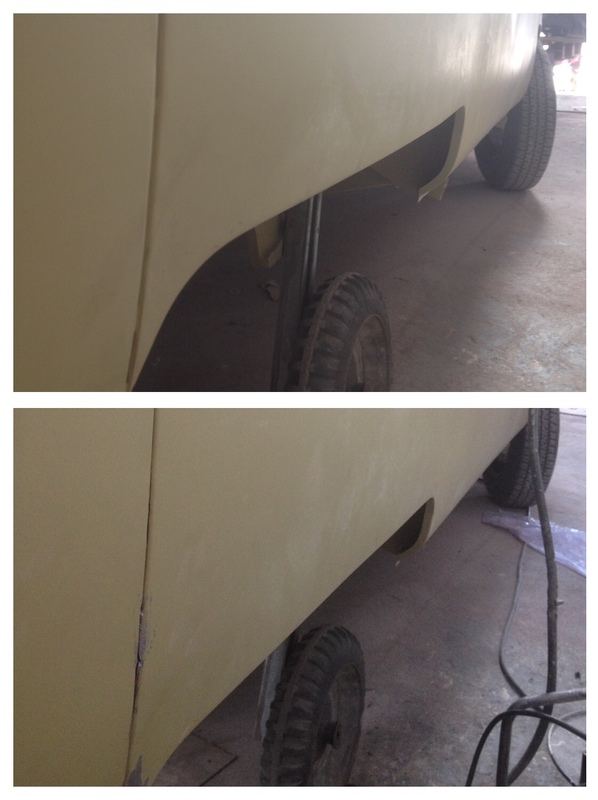 This entry was posted in Paint jobs and tagged car restoration by The Paint Shop Pros. Bookmark the permalink.